Okay, folks, it’s February. The exhilaration of the new year has worn off a bit, now it’s time to stop thinking about meal and menu planning and actually do it. You with me? I had a chance to try out some of those freezer meals I put away a few weeks back and this was one of them. I believe it was inspired by this recipe at Plain Chicken, but my version does NOT include cream of chicken soup or prepared garlic bread seasoning. Instead I used coconut milk for the cream soup plus the applicable seasoning, garlic oil, and Parmesan cheese along with a splash of apple cider vinegar. 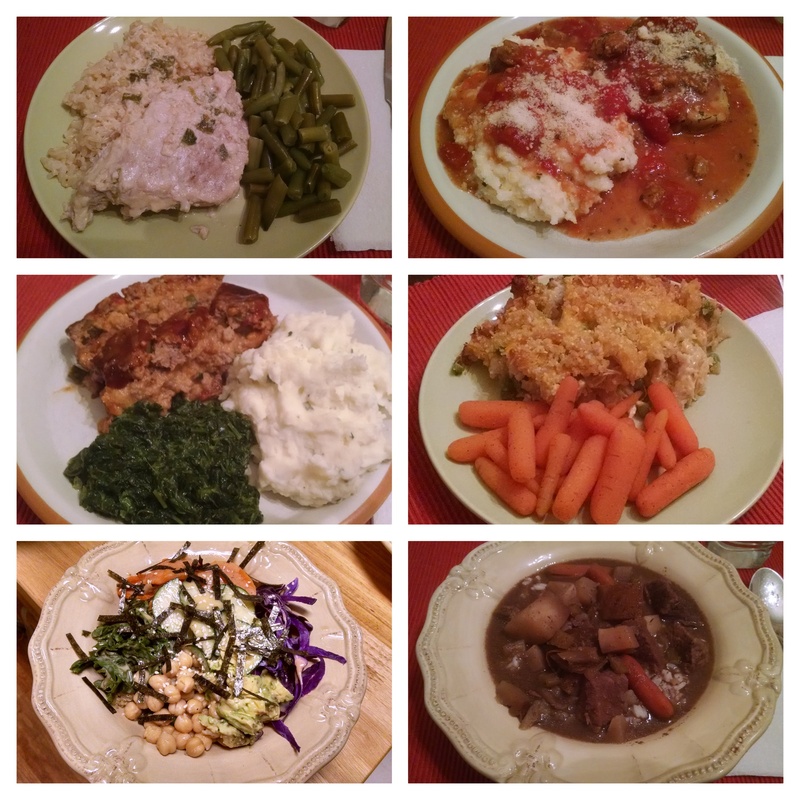 I don’t know how the original tasted, but ours was very good and, yes, the convenience of just throwing the prepared everything into a baking dish and setting up the rice cooker did make dinner that night even easier to prepare. In Italy they call it polenta, down here we just call them grits (they’re not the same, but they’re close cousins, and if you cook grits low and slow they don’t turn out gritty at all); they make a nice side dish option for a little something different. I added some garlic olive oil, Italian herbs, and chives to add color and flavor and used a little less liquid than I normally would for regular grits. The Italian Sausage and Tomato gravy is another one that I came across while hunting up freezer meals (found here, but I skipped the cream cheese), but I only had half the sausage it called for to top pasta, but it was enough to top the chicken and grits polenta. This one will likely happen again. Our first freezer meal meatloaf and I’m sold on it. And what goes better with meatloaf of any stripe than mashed potatoes? Total comfort food meal along with the spinach. I’m glad I made two of these meatloaves (from The Virtuous Wife) when I was prepping the freezer meals because we get to have this again with very little effort. I found this recipe from Flavor the Moments while browsing Pinterest and it sounded novel enough to give it a whirl. It made for a perfectly fine supper but, if you already have a favoriteÂ from-scratch mac and cheese, you don’t necessarily need to click the link. The gimmick, here, is that you make your white sauce and mix it and the dry pasta together and let sit overnight, “cooking” the pasta in the process. Unlike the overnight oats trend, this doesn’t seem to save time or dishes since you still have to mix everything together and bake it for an hour. I could just as easily boiled the pasta while making the sauce and, then, the finished casserole probably would have only needed half the time in the oven. Like I said, it was fine, but I’ll stick to my own recipe if I want any sort of mac & cheese in the future. Sadly, some friends are moving to Reno in a few weeks, and we all met up at a local Indian restaurant to wish them off. 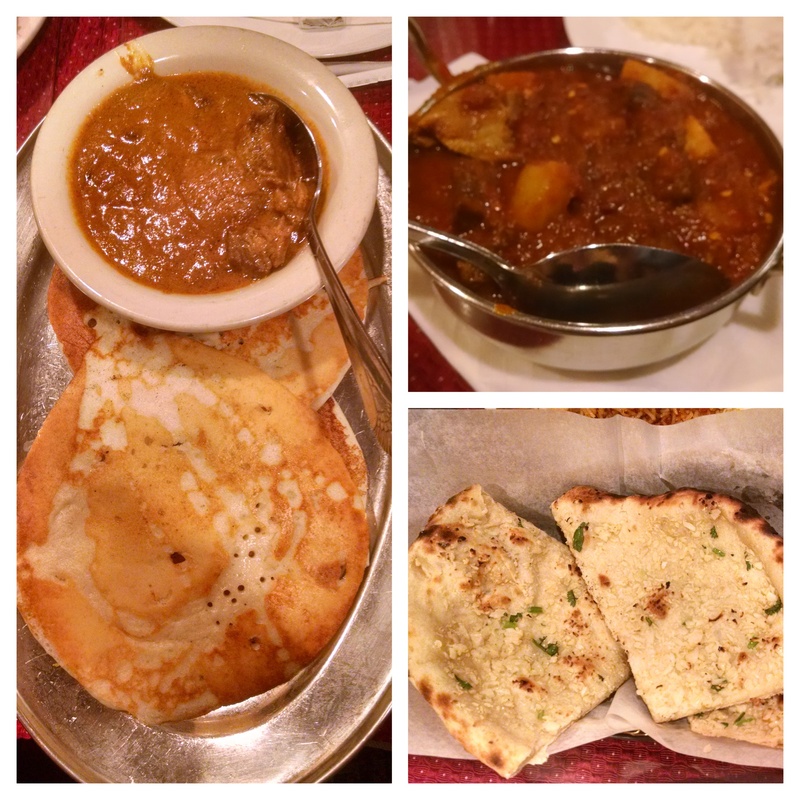 I ordered the Kal Dosa (rice pancakes) with Chicken Curry and Todd chose the Goat Vindaloo and Garlic Naan. I also had a cup of their chai and it was very tasty–not the sweeter version that I drink frequently at home, but very good nonetheless. Again, browsing Pinterest brought up a post from Keepin It Kind about macro bowls. I may have been intrigued by the Turmeric-Tahini dressing most of all, since we have a jar of tahini that needs using up and I can only do some much hummus. My eventual bowl (quinoa, chick peas, kale, sweet potatoes, red cabbage, nori, avocado, and cucumbers) might not technically count as a macro bowl (no fermented veggies–Todd’s not a fan), but it was very filling and made for a good meatless meal. At least I thought so. Todd wasn’t as impressed with it. Oh, well, you win some you lose some. A secondary lesson from our freezer meal adventure is that Ziploc freezer bags are not what they used to be! It’s gotten to the point that I’ve designated a particular bowl to be the defrost bowl, and anything with the remote possibility of leaking needs to be in it when defrosting in the fridge to reduce spills and cross-contamination. They’ve always been the gold standard for freezer bags but the boxes we picked up from Sams are consistently leaking upon defrost. It’s quite unfortunate and more than a little frustrating. On a happier note, I had reason (reason, craving, take your pick) to whip up some artichoke dip for a snacking lunch on Sunday. 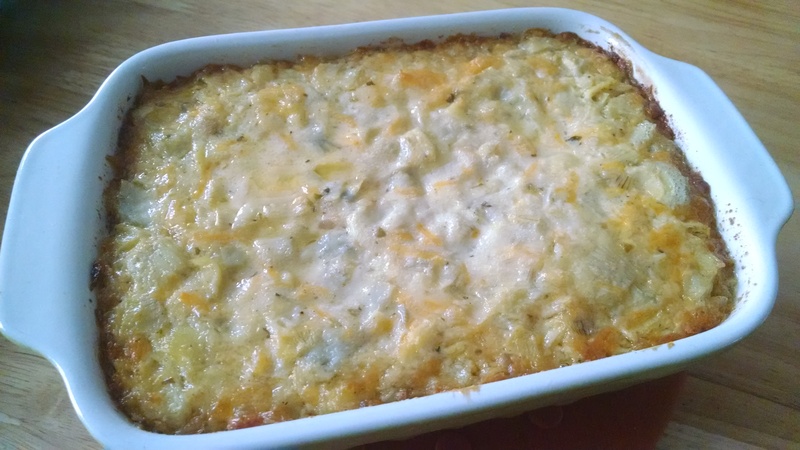 Artichoke dip is, at heart, a simple recipe and I saw one recently from Positively Stacey that used green chilies in the mix. Of course, I was out of green chilies and we were nearly out of Parmesan cheese (the horror), but that’s not a reason to give up, just an opportunity to improvise. So I present to you, my Three-Cheese Artichoke Dip, just in time for weekend noshing (or a certain football event that I hear is coming up). Preheat your oven to 350Â° F.
Mix all ingredients together and place into a small casserole dish. Bake 30 minutes or until the edges are all golden bubbly. Serve with tortillas, pitas, or crackers. Recaito is a cilantro and bell pepper blend that Todd keeps on hand for when he cooks out of his favorite Puerto Rican cookbook. It doens’t have the heat of diced green chilies, but it does have a lot of flavor. We grazed on this Sunday afternoon in place of lunch while we worked more on the bathroom and other household chores. Have a tasty week, my friends! Anyone have any good dinner plans for next week’s Chinese New Year? Never? Oh, that is a shame! Yes, you must try it at least once, it’s so good!